INI TOKENS – Forge INI items as you prefer! INI tokens can be used to forge any kind of INI item available inside game. 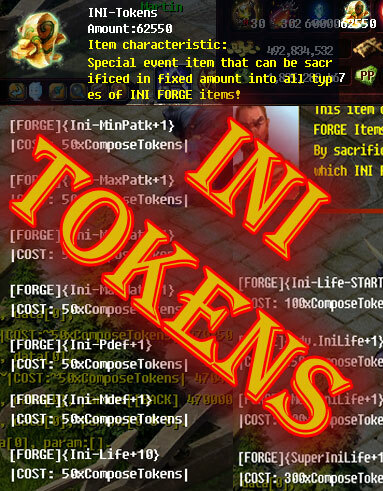 In order to do this you just need to have enough amount of INI Tokens inside bag – then from right click on item forge whatever you wish to. 3 Comments ON " [FEATURE] INI Tokens "
I feel drop rate should be increased, or the amount of tokens awarded at once should be increased. At gobi desert where there mobs are condensed it took me about 10k kills to earn 220 tokens. Thants only two Ini forgers for every 10k kills. In the previous Ini drop events in that same amount of kills i could have gotten half a stack of forgers.